we've also potted up some seeds, including basil and some mixed leaves. we've already got a good lot of fresh herbs in tubs all around the house with the following in: thyme, french flat leaf parsley, curly parsley, ginger mint, rosemary, chives, and basil. one day i hope to add dill to the mix, given just how much i use it! and a bay tree would be nice too, as that's a staple in my italian and fish recipes. but, i think these few are enough to take care of for now! 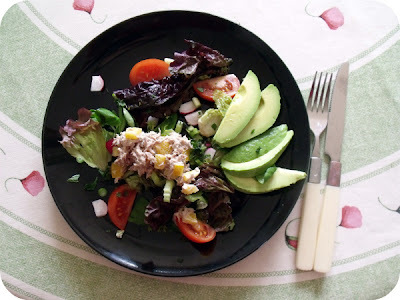 ♥ tuna mayonnaise - a rare dish in our house, but makes a nice change for a salad topping! 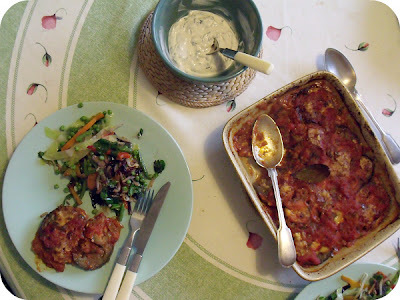 ♥ tomato aubergine bake - done the classic french way. aka, taking a really long time creating a perfect herb tomato sauce and salting and frying each piece of aubergine before layering it all up in the dish and baking it in a hot oven. served with thyme yogurt mayonnaise and some mixed vegetables. ♥ soy flour beignets - i won't lie and tell you these were wonderful, but i will tell you they have possibilities - i found the recipe in the back of dr bernstein's diabetes solution , and wanted to try it out, so i did. but it needs editing to turn it into something marvellous...maybe more cinnamon, baking powder, yogurt, ground almonds? stay tuned. what a random mix of things! i'm still loving the primal lifestyle, and i'm taking steps towards reducing my dairy and increasing the quality of the meat i eat. i've got a holiday in france coming up in may, before i head out to australia, and so i'm going to re-read healthy at 100 and in defence of food whilst i'm there - i can't wait! i'm hoping it will help focus me, and establish some core eating principles that will do both me and the environment good. currently listening to: the sound of a ticking clock. yes, a real one. ps. i wonder if you would like a few photos or a video of our herb pots, garden and allotment? Lovely tuna salad! It's one of my favorite salads. I'm just starting my garden growing here in Seattle. We've not had the weather to get it going until recently! ahhhh tuna- thanks for the reminder! I havent had it in TOO long! I've never tried soy flour! 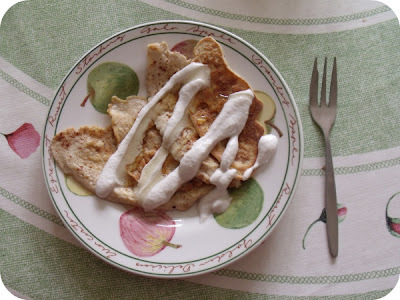 I love anything with cinnamon though, so those pancakes look AMAZING to me! !